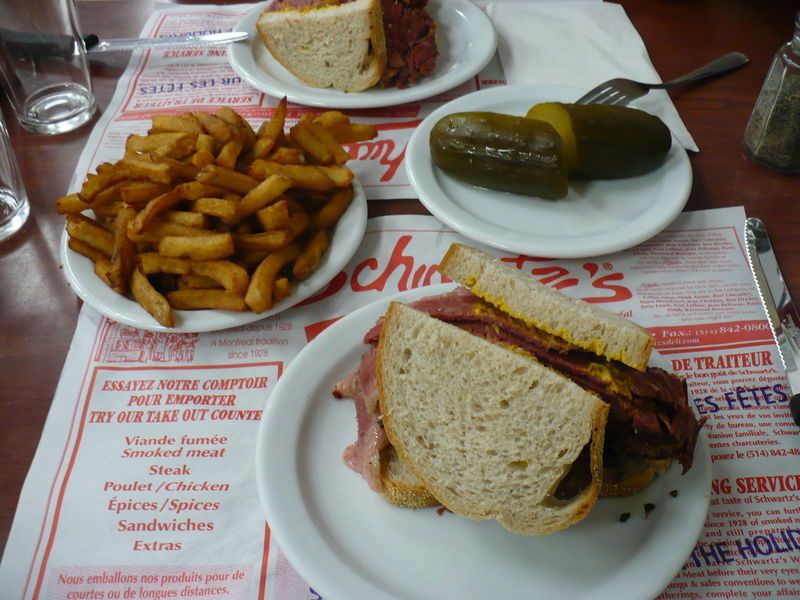 Shame on all of the people who took to Facebook castigating the famous Schwartz's Deli on St. Laurent Boulevard without getting all of the facts. 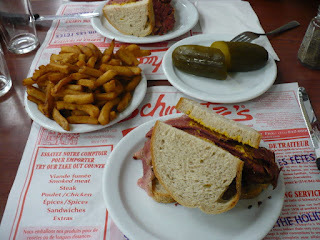 A printing error in the debut Montreal edition of the Jewish Pages put the smoked meat palace into full damage control. Schwartz’s first opened in 1928, launched by a Jewish immigrant from Romania named Reuben Schwartz. Located on trendy St. Laurent Boulevard, affectionately known as the Main, it was sold last spring by chartered accountant Hy Diamond in a multi-million dollar deal to a consortium headed by singer Céline Dion, her husband René Angelil and the Nakis family. Lineups typically snake up the block just to get a seat inside. Co-owner Anastasia K. Nakis told me that the past week has been extremely trying for her partnership. 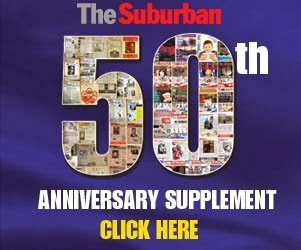 The Jewish pages printed an advertisement and according to officials there mistakenly added the MK symbol, lending the impression that the restaurant serves kosher food. This ad was reproduced on Facebook and an onslaught of criticism began against Schwartz’s. The Jewish Community Council even got involved, with executive director Rabbi Saul Emmanuel confirming to the Jewish Tribune that legal action was to be taken. See lower down on their website for their retraction. An official from The Jewish Pages will tell me more tomorrow, but the publication is taking full responsibility for the mistake. Nakis said that all she did was send the magazine her logo ” and they made the ad. "They added the MK and kosher and I told them to remove it because we were not kosher," she said. "Their original wrong ad went to print instead of the amended version. This spiralled as someone took the ad and made a poster of it without me or my partners permission and sent it out to the Jewish community. To tell you the truth, the way my staff and my partners and I have been mistreated and insulted by something that we had absolutely no control over is really upsetting. My 18 year old cashier got berated by an irate woman the other day while she was minding the cash - just screaming at her on the phone. It's out of control." When I reached Michael Seltzer by phone last week to ask him how he managed to revive the landmark steakhouse Le Biftheque, which opens for business again next week, he invited me to come visit the original Cote de Liesse location to see how the project is proceeding. With his wife/slick business partner Linda and long time general manager Gilbert Laurin by his side, he escorted me throughout the large property to illustrate the total makeover taking shape. An army of workers were in every corner. Thirty-one years ago Seltzer introduced Le Biftheque to Montrealers. A series of franchises soon sprung up elsewhere in Quebec and Ontario. In 2005 he sold the flagship restaurant on Cote de Liesse and rights to all of the franchises, accepting an offer he just could not refuse. The two subsequent owners both filed for bankruptcy. Seltzer was unsuccessful in buying it back the first time, but last summer he sealed the deal. Now residing primarily in South Florida, where he operates another steakhouse called Gameroff’s, he’s pouring a significant amount of dollars into the building. Besides a completely revamped and more elegant interior, there will new sushi bar right off the lobby, a roast beef cart and special fruits and vegetable items, to go along with popular staples like the rib steaks, fresh rolls, croutons, and of course the famous butcher shop. Le Biftheque was always one of my favorite restaurants.I mourned its passing and cannot wait to be back at one of their tables. Here is my video interview with Seltzer. There is no telling when the Montreal Canadiens will resume playing hockey. It is all in the hands of the least popular man in professional sports, Commissioner Gary Bettman and the NHL Players Association boss Donald Fehr. The cancellation Friday of the Winter Classic in Michigan indicates that the entire 2012-2013 season may be lost. On Friday November 2 I was at McGill University's McConnell Winter Stadium to see the hometown national champion Redmen host the York University Lions. It was a special daytime Score with School Contest, which I had the distinction of organizing for the English Montreal School Board. Thanks to the tireless work of my colleague Daniel Smajovits, we worked directly with Martin Routhier of Rooths Sports and managed to attract more than 700 students to attend. The message repeated was "Stay in School." McGill won 2-0. 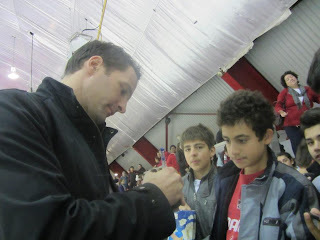 Darche signs autographs at McGill game. We were very fortunate to have the best ambassador any school can ask for in former Hab Mathieu Darche. Here is a man who got his degree at McGill in Commerce and Marketing, made it to the pros and carved out a pretty good career for himself. Over the last number of years he was my favorite player on the team. A real grinder, he took the body, dove in front of shots and scored some key goals. More importantly he was the best ambassador the team could ask for, always available to talk to the media and present at community events. Last summer new Canadiens GM Marc Bergevin offered Darche a two-way contract, meaning that if he was sent down to the minors he would take a significant cut in pay. The message was being sent that he was simply not in their plans. Strangely though, they signed another forward in Petteri Nokelainen in the same salary range. Nokelainen was hardly a fan favorite, nor much to write home about. Certainly keeping Darche on the roster would have been a much better move. The NHL lockout has not been good news for any of the players. In the case of Darche, he is an unsigned free-agent in the latter part of his career. He also has a family residing happily on the South Shore following a decade of being constantly on the run. If this NHL mess is ever resolved, I would bet some team will grab him. I still hope Bergevin will give Darche more consideration. 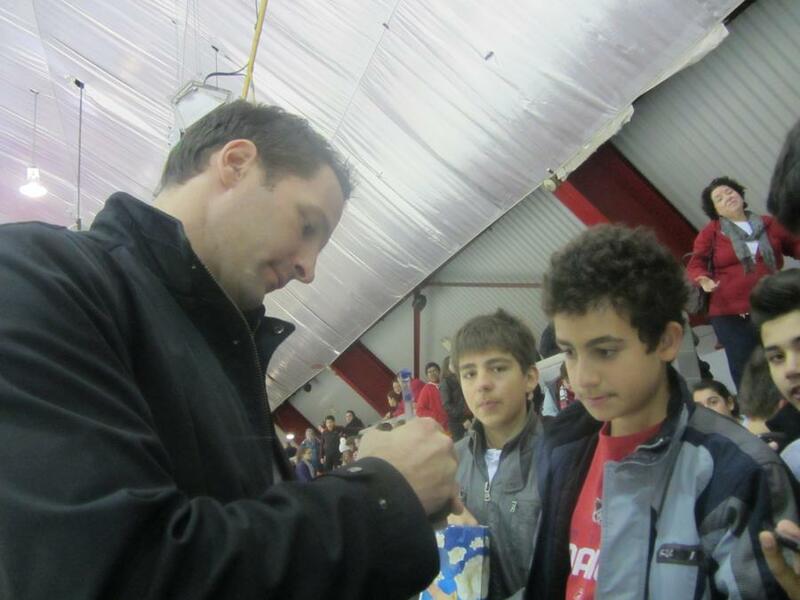 At the moment Darche is a key player in the NHL lockout, part of Fehr's negotiating team. "I speak to Donald Fehr regularly," Darche told me. "I am so impressed with the man." Should Darche decide to retire, the Canadiens would be well advised to hire this guy and put him in the head office as part of their community relations team. In fact, he'd be the ideal person to head such an initiative, getting his foot in the management door on his way to one day becoming an assistant coach or general manager. Perfectly bilingual and educated, he is a fabulous role model out there for all of the kids whom we want to keep on the right track. Failing that, I am sure there is a place for him in the local broadcast media. When we brought Darche to LaurenHill Academy in September, and again at the game on November 2, every kid wanted his autograph and to talk to him. They all knew he wore number 52. He helped us promote the game at McGill, which by the way was very entertaining. Folks who miss the Habs can certainly have a bit of their appetite filled by seeing the Redmen or their crosstown rivals the Concordia Stingers play. There was plenty of end to end action, good body contact and a nice ambiance in the arena. With a surround seating capacity of over 800, with an impressive VIP lounge, this is a great place to watch hockey.